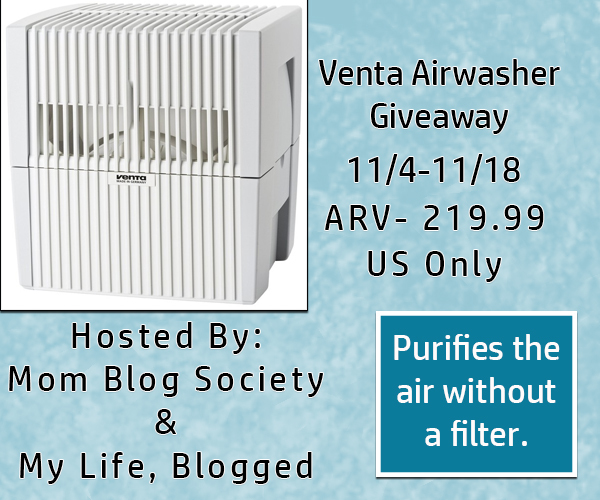 This giveaway is sponsored by Venta and hosted by Mom Blog Society and My Life, Blogged . The Venta Airwasher is a premium quality 2-in-1 system that constantly humidifies dry air in the home while simultaneously purifying it and it’s the original product that uses this principle without using filter pads. The idea behind the Venta Airwasher is simple: water is the filter. Dry, dirty indoor air is drawn in and washed by water, stopping the transmission of bacteria, germs, dust, allergens and odor-even the smallest particles. At the same time, pure water evaporates, humidifying air to the perfect level. It is hygienic, built to last a lifetime (made in Germany! ), and easy to operate, fill and clean. Who would it be the perfect gift for? Parents want the best for their babies, and that includes the air they breathe when they sleep and play. Give them peace-of-mind this holiday. An airwashed room aids in restful zzzs and reduces the risk of infections. Plus, Venta is whisper quiet, so it won’t disturb baby’s sleep; and it can’t over-humidify. Your BFF eats organic food, buys expensive face cream and filters her water. Shouldn’t she wash her air too? Room heating dehydrates skin and hair and causes static electricity, meaning bad hair days and a fatigued ‘look and feel’ overall. Give her the gift of ‘rejuvenation’ and help her get that alert holiday glow from the inside out. When it comes to green energy, Germany is leading the way investing in renewable sources. Even your greenest friend will feel good about using Venta, and not just because he is breathing pure humidified air. Venta is filterless, made from recycleable materials, uses less electricity, and built to last a lifetime (i.e., it‘s not something that needs to be thrown away after each season because it can’t be cleaned). Your mom loves the family dog, but hair is everywhere and she‘s a tad allergic to Fido’s dander. Dry air also contributes to jarring static shock every time she pets him. For the pet owner who prioritizes her health in line with her pets’, clean, allergen-free air is best for all. Dry heating air in winter damages wood by warping it. For the guy who takes care of his home, Venta will help sustain wood furniture by humidifying the living room or any room constantly to the perfect level without over-humidification or white dust. My favorite feature is that it humidifies the air as it cleans it. Cleans the air and humifies too! I love that it purifies the air without a filter and lasts a lifetime. I love that it cleans the air and acts as a humidifier.